Yes, Edison was a committed cat-napper, often taking time to curl up after a long stint at work and catch some well-deserved shut-eye. He spent many long hours at the labs with his beloved staff, churning out new ideas, tuning and tweaking the latest potential new products, taking care of business and checking on his various companies…of which he managed 30 such companies and 10,000 workers alone at West Orange. All this he did from his beautiful library-office. He also had additional off-site buildings and industrial sites under his Thomas A. Edison Industries banner-head. 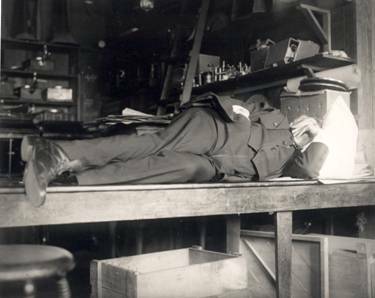 No workers at the labs could ever accuse the “old man” of shirking his duty and slacking off. When you work over 90 hours a week as his timecards attest, there can be no doubt about his contributions and commitment to making the business work. Obviously, his caring wife Mina worried over his long hours; but she being well-versed in the eccentricities of inventors understood the nature of the man. After all, her father was an inventor of farm equipment and machinery, her husband-the world’s greatest inventor, and her youngest son Theodore, also an inventor. She had “earned her stripes“ with the breed of man afflicted with the invention bug. As the dinner hour usually came and went, Mina might send some dinner down to the labs with one of her sons or the butler; or ask them to bring dad home for some rest…if they could find him among the labyrinthine complex of buildings and industrial nooks and crannies of his world-famous enterprise. They might even find him stretched out [above] on a vacant worktable, desk, or lab bench. 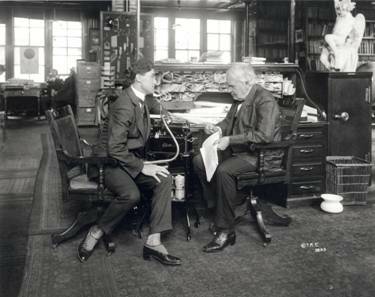 Edison was not fussy about where he took respite. 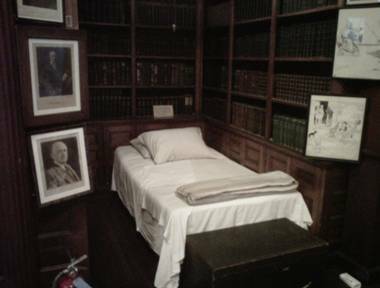 Mina did obtain a comfortable bed for Tom, still seen in a small alcove in his office-library today [below]. Here she must have reasoned, he could take a quick re-charging nap and at least not get his clothes soiled or stained from the chemicals and lubricants and other liquids so ubiquitous in the warren of industrial buildings he had constructed. Who knows how many of those naps he took yielded dreams for new products and inventions. Sleep well Tom…….and thank you. 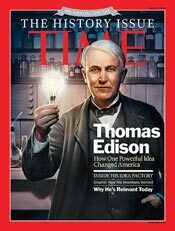 This entry was posted in All About Tom on March 4, 2012 by Edison Innovation Foundation.